On a rainy night, Esther, a patient aboard the Gippsland Mobile Medical Centre, asks Ted, a local boy, to help her discover the history of how the airship originally washed out to sea. Through communing with the spirits of the ship, they tell the story of two swashbuckling vagabonds and their anti-capitalist mission. Esther and Ted are two characters who will also feature in the upcoming Wayward Strand - an experimental interactive story game by a Melbourne-based team of creators. It's about Casey, a teenage girl who explores an airborne hospital, getting to know the patients within. 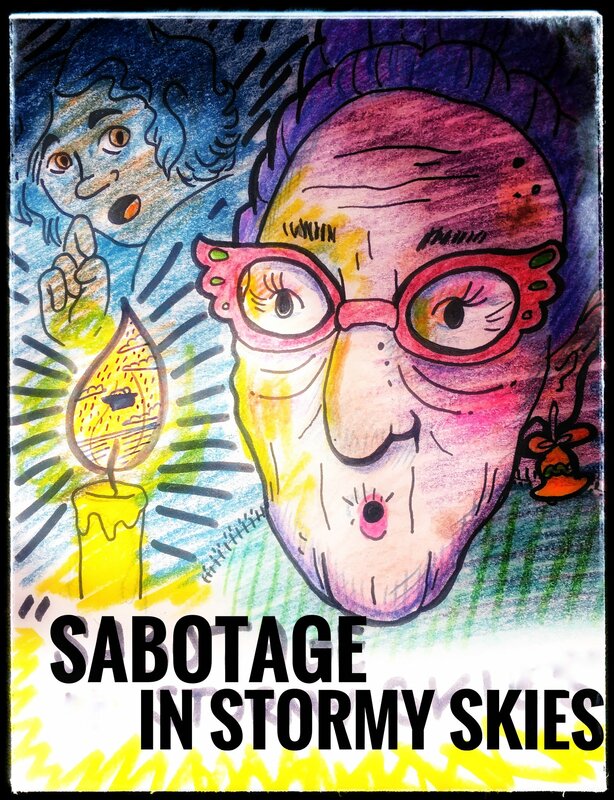 Sabotage In Stormy Skies was made by the Wayward Strand team - Maize Wallin, Kalonica Quigley, Jason Bakker, Russell Dilley - with some across the ditch support from Marigold Bartlett, and help from a special guest, Thomas Ingram. PS: Here're Ted and Esther in a Goldie original - this very cool book-cover-inspired image (that Goldie somehow managed to make on her phone :o ) is a depiction of the characters who're actually telling the story! I admit the white screen with the band of black at the top--along with the complete silence--threw me off at first. I thought there was a problem with the resolution and audio. Then the animation began--perfectly in sync with the text and the sound effects. What fun! And that parrot!! Thanks Christine!! We're all chuffed :D We've tweaked the intro a little bit to hopefully make it clearer that it isn't bugged out!